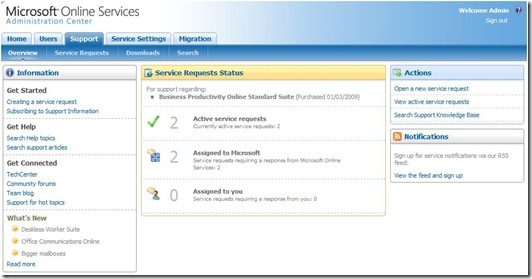 Microsoft BPOS – Business Productivity Online Standard – First Thoughts. We were experiencing some issues with our hosted email provider through 2008 and were looking to move away from them at some point this year. Together with our own business strategy of providing hosted solutions we were keen to continue ‘consuming our own food’ so to speak. Hence we were on the look out for a smaller number of service providers for our core service of email, conferencing, collaboration and instant messenger/presence. 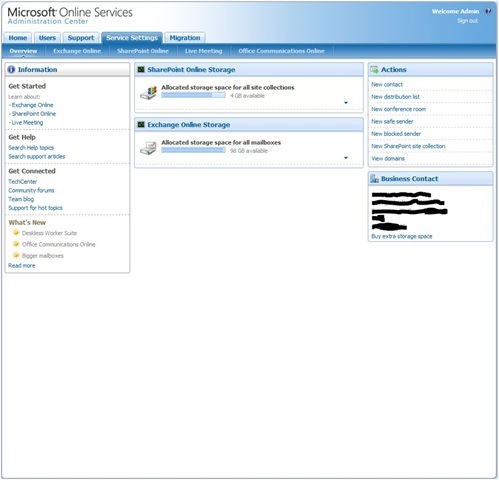 Having signed up as a partner of Microsoft Online late last year, we also felt we needed to experience first hand what some of our future clients would go through and decided to move to Microsoft Online service when it became more widely available. 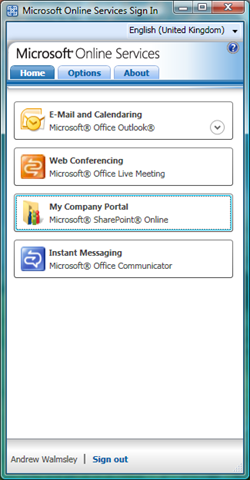 Business Productivity Online Standard Suite (BPOS) – encompasses Exchange Online, SharePoint Online, IM & Presence and Office Live Meeting services ‘all in one’ package. All of the above have been available predominantly in the US during last year and are now in UK and other parts of the world. 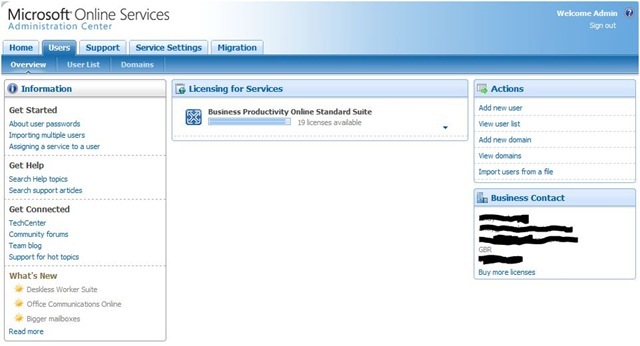 There are also dedicated offerings for the larger customers available whom wish to move perhaps their ‘on premise’ solutions into the cloud. We opted for the “Business Productivity Online Standard Suite” over a month ago now and though we didn’t replace all our services in one go, it nevertheless provided us with a useful insight into the challenges presented to businesses when moving from either ‘on premise’ or existing hosted service. 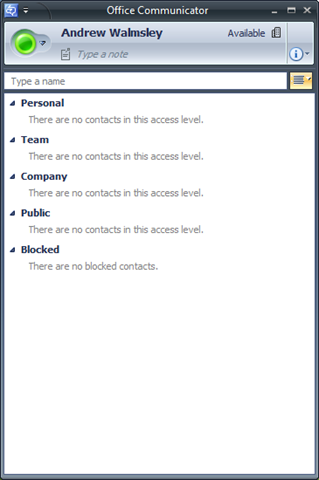 At this stage we have only moved our email and live meeting services over – though arguably our most critical application and service, (email) we felt comfortable with doing so based upon research with other beta users, demo’s I had seen plus existing experience in general with hosted exchange providers. 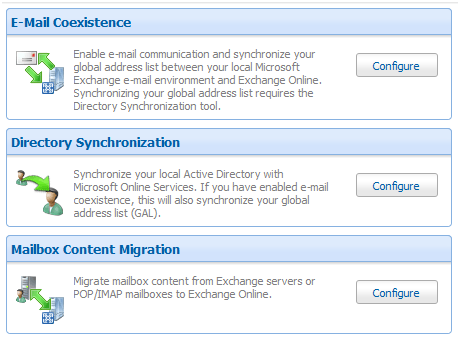 In addition to email and live meeting we were was also provided with these additional services as part of the package. So far so good. 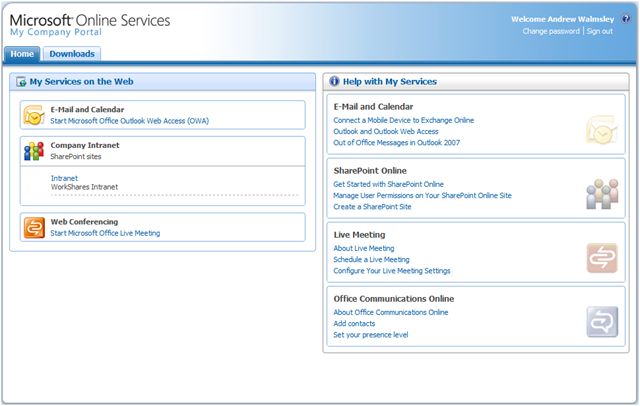 As you can see from the screenshots below, once you have the service up and running, the administration console is a clean intuitive interface with various options presented in tab like format. 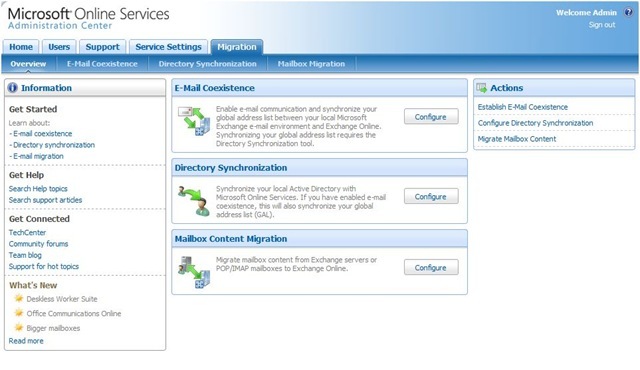 The migrating and setup of the Outlook 2007 client was fairly straight forward, though migration from hosted email provider isn’t particularly well catered for in terms of migration tools. This is to be expected I guess as there are so many configuration options here and many would need the server level access, ISP’s wouldn’t be willing to provide. 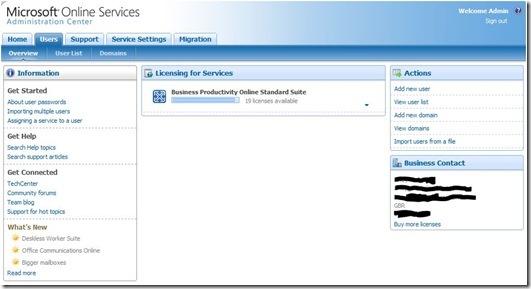 Not the same however for your ‘on premise’ based solutions it has to be noted, as Microsoft has provided several options in this arena for you to consider as part of your migration planning. As you can see from the image below, we have several options to consider and plan for. 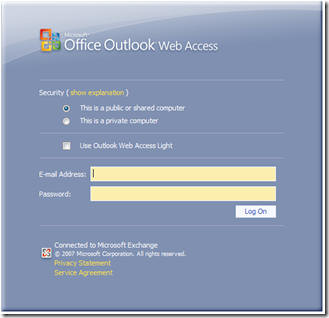 Once you’re email has been migrated you have access to your email either from your Outlook 2007 client. 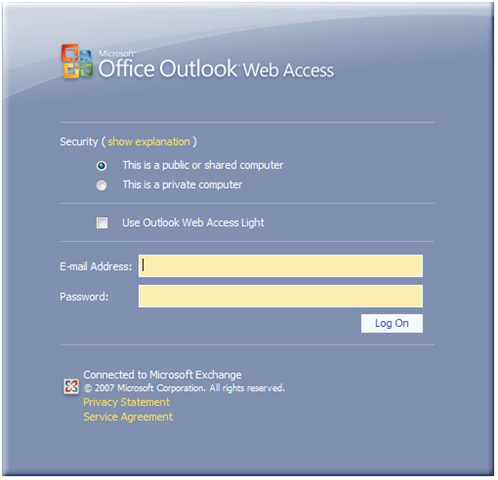 In addition you can access to your mail via the web browser in ‘Outlook Web Access’ shown below, which is great way to access your emails on customer or client sites. 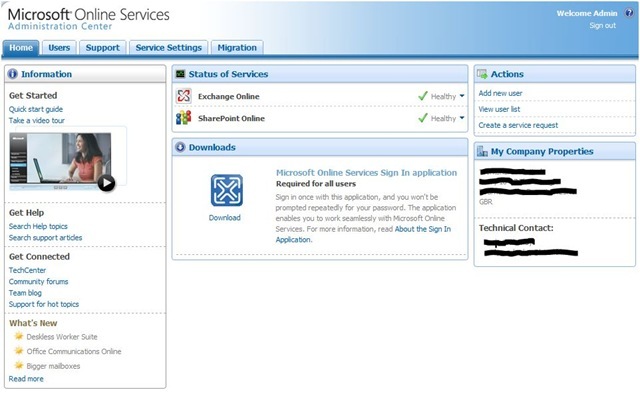 The Single Sign On application provided is a neat piece of software and very easy to use giving the user a single console like interface in which to launch their applications. 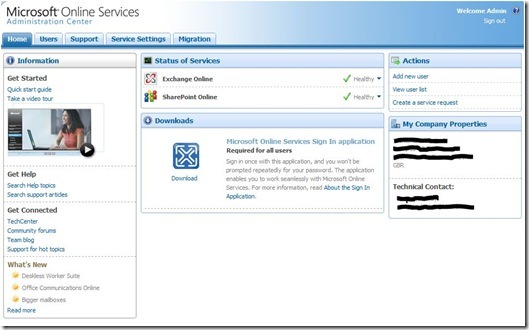 The single sign on application will take you to your personal user portal. 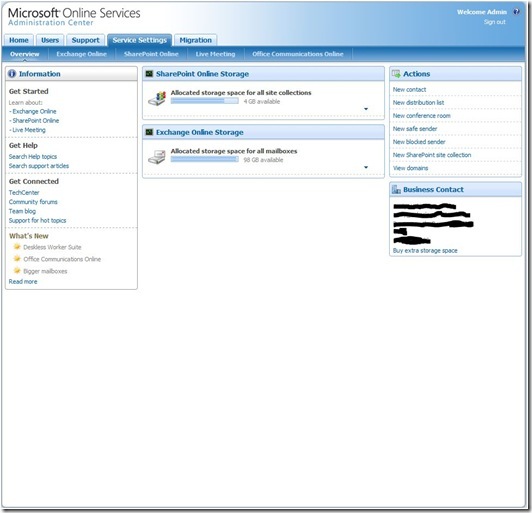 You get a number of different screens within your administration center, but the user portal is specifically personalised for your users and importantly has a lot of help already built into the site. 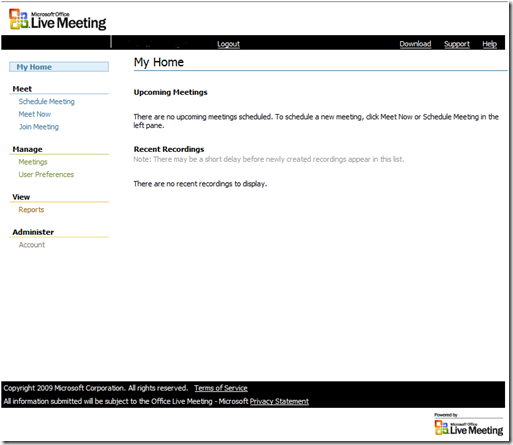 We have not done much here other than to see ‘it just works’ and provides usual features to allow for live meeting to take place. Not something we have played around with much either, but again it just seems to work as expected. We’ve only just loaded this up, but will consider migrating to it once things have bedded down a bit. 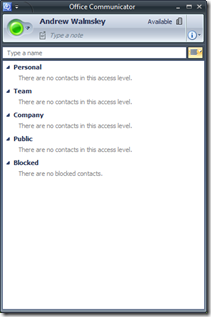 It’s basically an instant messaging application which will evolve into a ‘unified comms’ platform by 2010 supposedly. 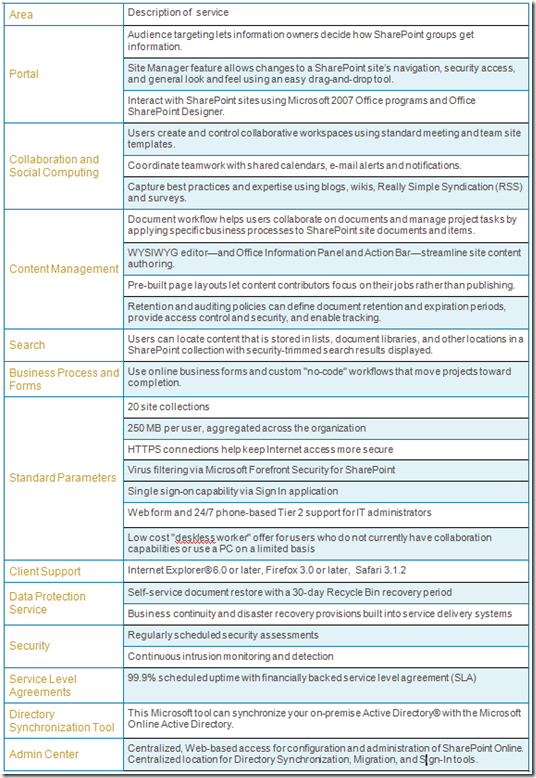 Here is a table with the features provided by the SharePoint Online service, which is part of the BPOS offering. Again, we haven’t done much in this arena as we have other providers for this at the moment, but it pretty much does what you would expect. 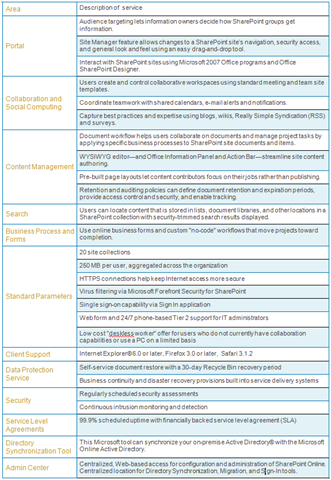 Note: It’s based on Windows SharePoint Services not MOSS for those interested. Responses in general to queries being raised were provided to us in a timely manner, either by way of updates to the support area and or by way of telephone during office hours. 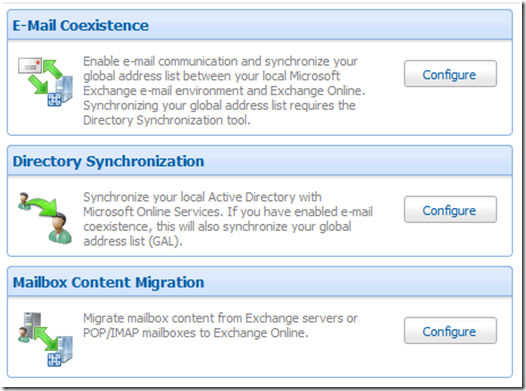 Our planning was thorough having gained experience in upgrades/migrations of Microsoft products with our day jobs, but we still came up with a few issues/challenges around email. We particularly like the online support area, which is much improved from our old provider and keeps you easily up to date as to progress with your support requests. Setup was ok as we mentioned, though not really for the ‘none techie’ or individual whom isn’t used to migration issues with Microsoft based technology. You do need to plan your migration carefully as there are many permutations to consider, especially for your ‘on premise’ existing email providers and or SharePoint content migrations – more on this for a later post. Support via email and telephone was excellent. Arguably the lack of ability to support custom modifications is a ‘Bad’ but feel we have a good compromise here. Besides which, the dedicated offering from Microsoft will allow this. 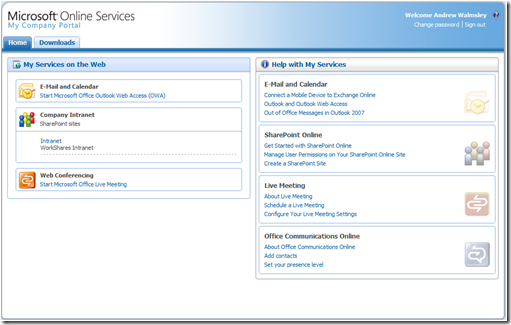 This position will probably changed for the better with SharePoint 2010…. It’s early days yet, and perhaps we will post back after a month or so of using it in anger! Otherwise, it just works from our experience to date. 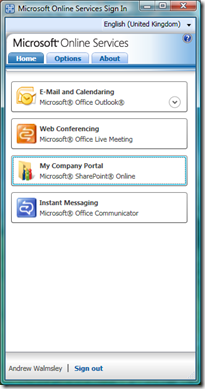 This entry was posted in BPOS, Office 2007, SaaS, WorkShares, WSS and tagged BPOS, Extranet, Hosted SharePoint, LinkedIn, WorkShares, WSS. Bookmark the permalink.